Team and committee members of the Bishopthorpe Football Club pose proudly with Archbishop Lang (seated, 2nd left) on the steps of Bishopthorpe Palace. ‘The Bishops’ had successfully completed their first season in the second division of the York & District League by winning the League. By September 1914, at least six of the team were serving with the colours. The fateful year of 1914 started ordinarily enough: A new set of billiard balls was purchased for the all-male membership of the Reading Room; an outbreak of mumps kept the school closed for a month; Archbishop Lang bought a new car – an open top 24/30 hp Wolseley; and the Bishopthorpe Football Team (‘The Bishops’) strode to success in the second division of the York & District League. As we now know, the peacefulness of village life was not to last. When war was declared on Tuesday, 4 August, the day following a Bank Holiday, the consequences were felt immediately. The hoarding of food had already started in July; the panic-buying caused shortages and price increases. Horses were requisitioned by the army thereby forcing farmers to rely on breeding mares to work in the fields. But, there was excitement too. Army bi-planes were seen landing safely on the Knavesmire despite the mist – it was thought that “these machines will play a very prominent part” in the war. Bishopthorpe folk visiting the city found York Station and the central streets almost impenetrable with hundreds of troops en route to the south. Later, in October, fifteen Belgian refugees arrived in Bishopthorpe. Six were taken in by Mrs. Watson at The Garth in Sim Balk Lane, while the other nine were housed elsewhere in the village. Two cottages were renovated and put at their disposal. A Belgian Refugee Hospitality Fund was set up and received several offers of money, provisions and furniture. Mrs. Watson’s husband, Arthur Toward Watson, was also busy. As chairman of the Parish Council he called a public meeting in September. This was to be addressed by Col. Sir G. Hayes and Sir John Grant Lawson “with a view to encourage recruiting for Lord Kitchener’s new regiments.” Newspaper advertisements and posters were already being published appealing for volunteers between the ages of 19 and 30 to help swell the ranks of the hugely deficient numbers in the British fighting force. 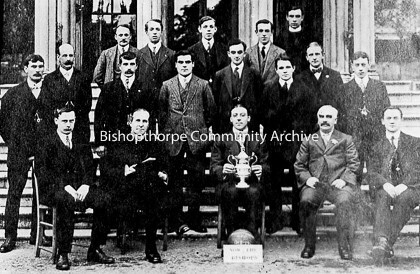 A surprising number of Bishopthorpe lads joined the colours in those early months of the war and, incidentally, several of them were from that cup – winning football team. We know who the 46 men were and when they joined because their names appear on a Roll of Honour in St. Andrew’s Church. A few were Regular soldiers, but most were Reservists, Territorials and young volunteers. The mix of men were from all classes: labourers, horsemen and cowmen from the six local farms; gardeners and servants from the larger houses and the Palace; railway workers and men from the building trades; office clerks from Terry’s and professional and business men alike. Experienced Reservists were soon sent out to the front line, men like Charlie Sharp of ‘The Woodman’ (see above: middle row, first left) who was invalided out suffering from a gunshot wound in the leg. At least he survived the experience, unlike two Regular soldiers, Cpl. John Bowlby and Lt. Richard Lumley, who did not see the year out. The reality was beginning to bite.